Pretty sure this picture right here is going to make us all want to make waffles very, very soon. Does a treat get any more delectable? Waffles are one of our favorite breakfast foods – especially when we top them with strawberries, blueberries, and/or whipped cream. This is a great meal to feed company who is at your house for breakfast. They are so easy to make, but taste like a great treat! My kids now call these “Super Mama Waffles.” If I was going to have a food named after me, I can’t think of one better than waffles. I’m pretty sure it’s the fruit and whipped cream that make these waffles super. 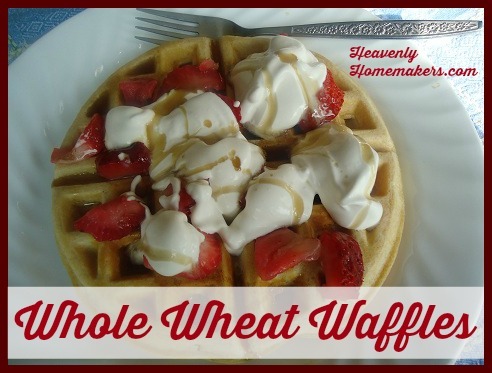 Keep these waffles in mind for dinner as well. And…we’ve even made big batches to feed college kids after church on Sundays for a fun lunch! Whisk all ingredients together. Cook batter in your waffle iron. I usually double this recipe and freeze the leftovers to be popped into the toaster another day! Stir ingredients together in a saucepan over medium heat for about 10 minutes until blueberries become a little mushy and syrupy. Serve over pancakes or waffles. Whip cream in a bowl until soft peaks form. Add vanilla and stevia and whip just a bit more. Serve Blueberry syrup and whipped cream over waffles. Delicious! Add protein to this meal by serving with scrambled eggs, ham, sausage, and/or bacon. Confession: We now have two waffle irons. Our friends offered us theirs when they moved away, and we decided that would help make the process of feeding the masses so much faster. Indeed, we can now make twice the waffles at one time that we once could when we only had one waffle maker. See how good I am at math? What are your favorite ways to serve waffles? You’ll want to be sure to check out our delicious recipes for Raspberry Syrup and Peach Syrup also. It is so easy to use whatever extra fruit you have on hand to make deliciously healthy syrups that end up being a fantastic treat! Have you tried culturing your own buttermilk? I posted on a few weeks back. It makes a huge difference. How do you do culture your own buttermilk? Please post link. Thanks! How many waffles does that recipe make, I have been looking for a new recipe. I doubled the recipe and used a Belgian waffle maker. This looks WONDERFUL… thanks so much for sharing! We like to do waffle sandwiches. We take the whole wheat waffles and spread peanut butter, thinly sliced apples and a bit of honey. YUMMY! 1) Can you use vegetable oil/canola oil in place of the coconut oil? 2) If I were to soak the flour overnight, could I soak it in regular milk soured with vinegar? Would that accomplish the same goal? And would that affect the taste? I don’t know if you check comments for this far back, but I have a question. Is there a reason to use coconut oil verses olive or canola? Do you simply do that for taste reasons? I’d like to know what kind of waffle maker you use, please. I loved this recipe and so did the kids! I’ve never thought of using the coconut oil like butter. (I just used it to make a pie crust too, might let you know how that turns out when I actually cook it.) Used the sprouted dried grain flour and it turned out so beautifully! Thanks! I made these for breakfast… right along with the blueberry syrup. Yum! Normally by now I would feel like I want to take a nap, but soaking the flour really made a difference. I’ll be making these again! Made these yesterday for Sunday breakfast! DELISH!! Thank you! I look forward trying this on the homemade pancakes that I have in my freezer. Yum. I will try this next week. Thanks for the info. The first comment was about culturing one’s own buttermilk. That would be neat, but there was no link. Do you do this, or know how to? Thanks. Ugh, I have no idea. It’s old and it’s icky. :) We got it as a wedding gift 15 1/2 years ago. Okay, I just looked. It’s called Dazey Short Order Chef. I’m going to bookmark this blogg on Identica to get more clicks for you. I’m getting a waffle maker really soon and I can’t wait to try this. I add all of the ingredients, leave it on the counter overnight, they are yummy. Would this accomplish the same thing as soaking only the flour and milk? I think so, since there’s no sweetener of any kind in the mixture. I am wondering how you find the home milled grain compared to reg recipes. I just made waffles with my own milled flour and the consistency was totally wrong, they were airy and would not hold together in my waffle iron. Any suggestions? Hmm, I don’t know. I always used home milled grain (using a Nutrimill) and I never have trouble with this recipe. And what kind of grain did you use? Laura uses hard white wheat. Here is a link that should have more information. YUMMY! I made these this morning (soaked them overnight) and they were delicious! I love your recipes because they seem so family friendly… really what I’m saying is my big boy husband will eat them! :) Thank you! Delicious and nutritious! Do you need to make any changes to use this recipe for pancakes? I don’t own a waffle maker and am trying to pare down my “electrical appliances” in my kitchen and haven’t heard of any other waffle options out there… anyone? :O) Can I use it as posted and have nice pancakes or do I need to make some alterations? If I remember correctly, you can take a pancake recipe and do “something” to it to make it suitable to waffle-making, I just don’t know what that “something” is and how to reverse it from waffles to pancakes. Waffles have more fat in them…just cut the fat in half and you’ll have pancakes! What can I use in place of the coconut oil? My son is allergic to coconut. Thank you! When you soak the flour and buttermilk overnight, I am assuming it is in the refrigerator. Is that correct? Looking forward to trying this recipe. We love waffles. Love these! Oh and I use olive oil – it’s my go to oil these days. :) Thanks for the yummy recipe! I made a double batch tonight for my husband and 4 children (baby has to wait a while longer!) and they were all eaten. I actually hoped for leftovers! I will triple the recipe next time. I told my husband I may never make pancakes again; they take a LONG time to cook and my children eat them more quickly than I can make them but the waffles were ready in less than 30 minutes. Thanks for the wonderful recipe! Hi! When soaking grains/flour over night, do you put it in the refridgerator or leave it on the counter? Thanks! Sorry! I just read another post where you said on the counter;) Thanks! Bookmarking this recipe (one of several tonight from your site). Thanks for sharing and inspiring all of us! Two questions: Do I need to soak the whole wheat flour if I”m not grinding my own? I buy King Arthur’s. And do you ever make a double (or triple or quadruple!) batch of the blueberry syrup? I’d like to so we’d have it on hand a few days in a row. Could I store it in a plastic container or a glass jar? of syrup it should be fine stored in a plastic container or a glass jar! Tried this recipe today. We don’t eat much whole wheat but trying to incorporate more. Generally we focus on multigrain or “whole grain”. I personally didn’t like the taste very much. I might try again by substituting out 1/2 cup of the whole wheat flour with white flour; then over time increase back to the 1 and 3/4 of whole wheat. Have you any other suggestions? (I did soak the whole wheat flour overnight in buttermilk). Okay. Another question… Yesterday I used the blueberry syrup on buckwheat pancakes and LOVED it. Today, however, trying to use your whipped cream with the pancakes and blueberry syrup. The cream is not foaming. It still looks like thin milk. I’ve whipped and whipped it. Is there a suggestion you can make? Thanks. It’s odd that the cream looks like thin milk…it should be thicker. I am not sure what I would suggest…Is it still cold? If it got warm that may make a difference. Re: my question April 5….I figured it out the second time made the whipped cream. I had an ephiphany to use my blender stick. That worked in no time flat to stiffen the cream. My coconut oil hardened and clumped up. Is this normal? what should i do? What can I use as substitute for coconut oil in the waffles? My hubby and kiddo love the blueberry syrup, do you know if it’s possible to can it for long-term storage? I’m guessing I would probably need to add some lemon juice maybe? Your waffle looks so nice…do you measure out your batter before you pour to make sure it gets to all the corners? Can you use all-purpose regular flour if you don’t have the whole wheat flour? Can I substitute a milk/ vinegar mixture for the buttermilk? Would that also work to soak overnight? Yes! That will work out fine.